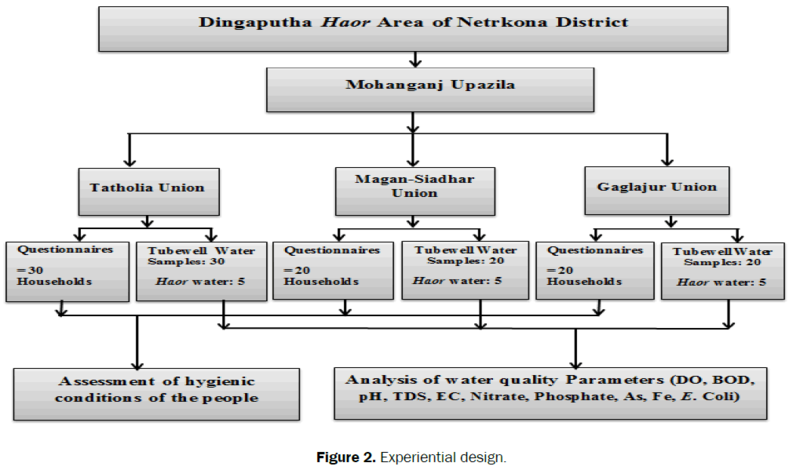 The study was conducted to investigate the drinking water quality parameters from different sources (tubewells and haor) and hygienic conditions of people living around the Dingaputha haor area of Netrokona District. It was found that the levels of DO, pH, EC, TDS, NO3- from both tubewell and haor water were within or near to standard level for drinking (ECR, 1997) and the levels of BOD, Phosphorous from both tubewell and haor water exceeded the standard level for drinking slightly. The Arsenic and Iron concentration of tubewell water exceeded the standard level for drinking extremely (WHO, 2003). The highest number of Escherichia coli bacteria was found in haor water due to open toilets nearby haor and the lowest number of Escherichia coli bacteria was found in tubewell water of Magan-Siader Union both of which exceeded the standard for drinking (EPA, 1996). It was also observed that about 82.5 % people had access to tubewell water for drinking and 17.5% people had no access to tubewell water for drinking. The hygienic condition of Digaputha haor area of Netrokona District was very poor. The distances between tubewell and toilet were very near to each other and the open hanging toilets nearby haor were also found. People using contaminated tubewell water for drinking and haor water for cooking were infected with various water borne diseases such as diarrhoea, cholera, typhoid, liver diseases (Cirrhosis, Cancer), skin disease etc. Water quality, sanitation and hygienic conditions should be managed and monitored properly in haor area. Water is an essential component of natural resources and plays an important role for the purposes of drinking, irrigation, and aquaculture and livestock usages. It is needless to say that without enough good water our survival will be threatened. Water occurs 97.2 percent in ocean as salt water, 2.09 percent in icecaps and glaciers, 0.6 percent ground water, 0.11 percent runoff and surface water . We have plenty of both surface and ground water supply to support the entire population in Bangladesh. In fact, after human resources water is the most abundant resource in Bangladesh. About 97% of the population of Bangladesh use tubewell water for drinking and cooking purposes . Bangladesh comprises the third largest source of fresh water to discharge to the ocean . The availability of safe drinking water, particularly in Bangladesh's hard to reach areas such as haor area is expected to worsen as the country experiences the effects of climate change. About 28 million Bangladeshis, or just over 20% of the population, are living in harsh conditions in the "hard-to-reach areas" that make up a quarter of the country's landmass. People living in hard-to-reach areas are often vulnerable to natural calamities like flooding, riverbank erosion and siltation . In Bangladesh, ground water has become increasingly important source of irrigation, human drinking and other uses. With the ever increasing demand of water in this country, the importance of utilization of ground water is increasing now-a-days at an accelerated rate. More recently, about 80% of the requirement of irrigation water and about 97% of the portable water of this country are being met by modern tubewell technologies . Development and utilization of ground water for irrigation and public supplies in both urban and rural areas have been done by sinking different types of water lifting devices i.e., deep tubewell (DTW), force mode tubewell (FMTW), shallow tubewell (STW), deep set shallow tubewell (STW) and hand tubewell (HTW) etc. However, this technology has also been found facing several technical and environmental problems such as rapid drawdown of the aquifer due to interference of other abstracting technologies (mainly DTWs), which restricts groundwater abstraction from shallow aquifers, drying up of STWs while drawdown goes beyond suction lift of pump, interaction with surface water bodies  and pumping of excess arsenic contaminated water in many places . World Health Organization (WHO) and United Nations Children’s Emergency Fund (UNICEF) global assessment reports have indicated that most of the world’s human population do not have access to safe drinking water, while one sixth of the world population (1.1 billion people) have access to adequately safe water supplies. Approximately 80% of communicable diseases in the world are water-borne. The availability of safe drinking water, particularly in Bangladesh's hard to reach areas, is expected to worsen as the country experiences the effects of climate change. As a result of climate change, drought in Bangladesh’s haor areas during dry season has increased, causing a lack of sweet water. Women in haor areas need to go miles to collect a pitcher of safe drinking water . The Millennium Development Goal (MDG) targets and coverage figures for access to improved water and sanitation in Bangladesh are difficult to interpret due to inconsistent application of definitions and national goals. Based on the goal to halve the percentage of people without access in 1990, the 2015 MDG targets are for 89% and 70% of the population to have access to water and sanitation respectively. Water termed as life because no life can exist without water. It is needed not only for drinking, for growing food, for washing but it is also important for many of the pleasant recreational aspects of life. Bangladesh faces many challenges that hinder progress in water; sanitation and hygiene (WASH), most urgently from high vulnerability to climate change effects, iron (Fe), arsenic (As), and microbial contamination of groundwater supplies and high levels of poverty. Several highly vulnerable locations including haor areas critically need . Water quality monitoring and assessment is the foundation of water quality management. Thus, there has been an increasing demand for monitoring water quality of both surface and ground water by regular measurements of various water quality parameters . 1. To assess the water quality parameters (DO, BOD, pH, EC, TDS, Phosphorous, Iron, Arsenic, Nitrate, Escherichia coli) from different sources such as tubewells and haor of the study area. 2. To assess people’s access to drinking water in haor areas. 3. To assess hygienic conditions of people living around the selected area. The study was conducted at Dingaputha haor area of Netrokona district (Figure 1). Dingaputha haor is situated in major part of Tatholia union and minor parts of Magan-Siader and Gaglajure unions of Mohanganj upazila, Netrokona district. The map of the study area was incorporated in the research paper through Geographical Information System (GIS). 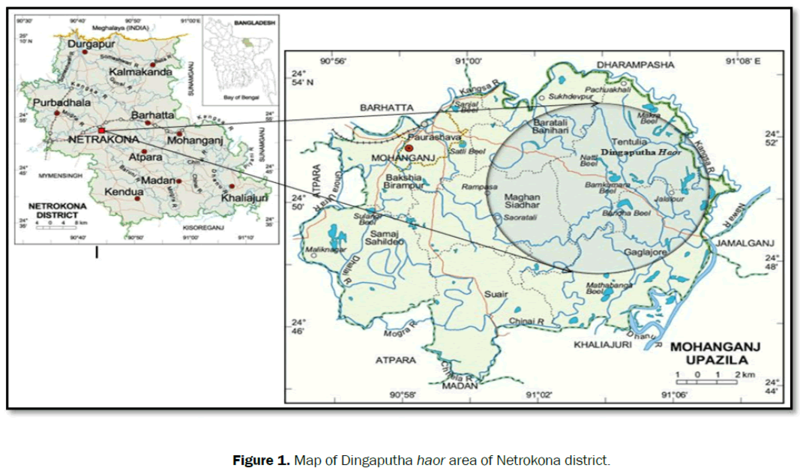 Figure 1: Map of Dingaputha haor area of Netrokona district. Total 85 water samples were collected from Dingaputha haor areas of Netrokona district. 30 water samples from tubewells and 5 water samples from haor of Tatholia union, 20 water samples from tubewells and 5 water samples from haor of Magan- Siader union and 20 water samples from tubewells and 5 water samples from haor were collected from January to May 2016. The Dissolved Oxygen (DO) of water sample was measured by DO meter (Model: 7031, Taiwan). The Biological Oxygen Demand (BOD) of water sample was measured from the difference between first reading of DO and last reading of DO after 5 days at 4°C temperature in incubator. The pH of water sample was measured by a digital water pH meter (Model: AG 8603, Switzerland) which has a glass electrode. The Digital TDS meter (Model: TDS02/03, Taiwan) had been used to determine total dissolved solid (TDS) of water sample. The Electrical conductivity (EC) of water sample was determined by the digital EC meter (Model: 3251K, China). The nitrate (NO3-) of water sample was measured using Nitrate Test Paper. The Phosphorus of water sample was determined by atomic absorption spectrophotometer (Model: PG 990) at 660 nm wave length. The arsenic (As) of water sample was determined using Arsenic Test Paper. Iron was analyzed by atomic absorption spectrophotometer (Model: PG990) at the wavelengths of 213.9, 324.7, 248.3 and 278.5 nm, respectively following the procedure as described by APHA (2005). The Escherichia Coli bacteria from water sample were detected using Eosin Methylene Blue (EMB) Agar Media and MacConkey Agar Media. EMB agar plates after incubation showed smooth circular colonies with dark centers and metallic sheen and MacConkey agar plates which after incubation, if positive for E. coli showed rose pink color colonies. Then, the colonies of E. coli bacteria from EMB media were counted in Feed and Food Safety Laboratory, Bangladesh Livestock Research Institute (BLRI), Savar, Dhaka. The research was carried out on the bases of primary and secondary information. In this research, interview with local people using questionnaire was applied for the data collection. The electronic and web based information was also used for data collection under direct guidance of supervisor. Information collected from different sources such as research paper, journal, internet and book as a secondary source of data. Both primary and secondary data were used for the study. Primary data was collected from the field level was intrinsic study and realistic feature are presented in the study. Data collection is very difficult and time consuming task. Data had been collected through interviewing technique through a questionnaire which include all essential questions those are relevant to the study. Data have been collected directly from the respondents. Present study had collected the primary information from the knowledgeable people or members who are related directly with water and sanitation. Data for this study were collected from January to May 2016. The study population was the households with the latrines having at least 3 rings and 1 slab. Having water seal was an operational criterion as its presence was not very common in the study areas. The sample size was estimated = 70 households, through purposive sampling and the main sources of income of respondents come from agricultural land and fishing. First step after data collection was to ensure the validity and reliability of the data. Coding operation was usually done at this stage. With the coding the stage was ready for tabulation. Tabulation was generally based on percentage. MS Word and MS Excel were used to analyze the data. Quantitative data was analyzed through descriptive statistics. One way \ two way analyses were used in this research. The highest mean value (DO=4.99 ppm) of Dissolved Oxygen was found in Gaglajur union and the lowest mean value (DO=4.29 ppm) of DO was found in Tatholia union that was within the standard DO for drinking (DO=4-6 ppm) (Tables 1-3 and Figure 3). Raman et al. showed that the value of DO of tubewell water collected from Rakibnagor slum of Sakhipur upazila in Tangail district was 4.4 ppm. 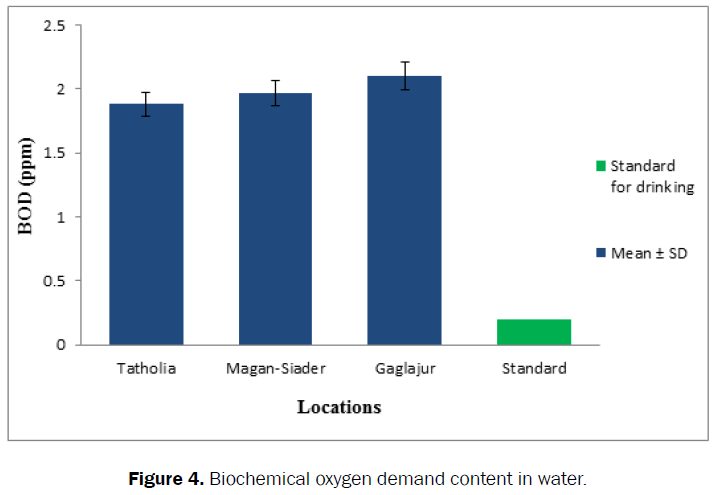 The highest mean value (BOD=2.1 ppm) of Biological Oxygen Demand (BOD) was found in Gaglajur Union and lowest mean value (BOD=1.88 ppm) of BOD was found in Tatholia Union that exceeded the standard BOD for drinking (BOD=0.2 ppm) (Figure 4). Raman et al. showed that the value of Biological Oxygen Demand (BOD) of Tubewell water collected from Rakibnagor Slum of Sakhipur Upazila in Tangail District was 2.4 mg/l. 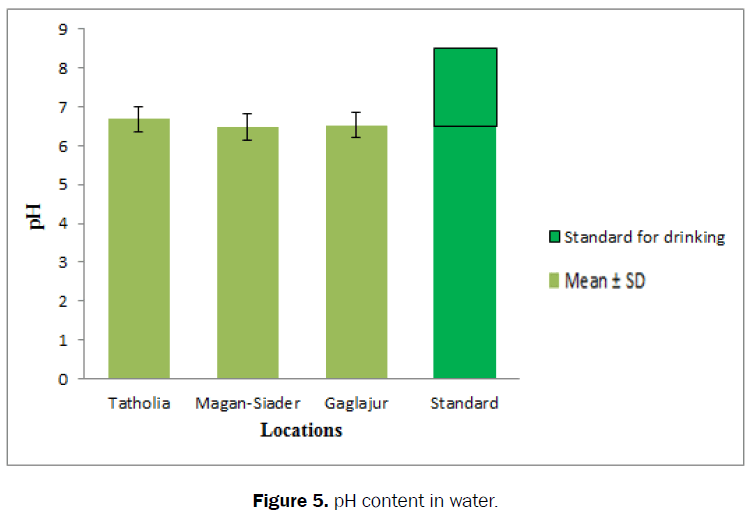 The highest mean value (pH= 6.68) of pH was found in Tatholia Union and lowest mean value (pH=6.52) of pH was found in Gaglajur Union that was within standard level of pH for drinking (pH=6.5-8.5) (Figure 5). Jesmin  found that pH values of ground water in Gaibandha aquifers ranged from 6.73 to 8.66 reflecting slightly acidic to alkaline in nature. The highest mean value (EC=349.91 μs/cm) of Electrical Conductivity (EC) was found in Gaglajur union and lowest mean value (EC=345.1 μs/cm) of EC was found in Tatholia union that was within the standard level of EC for drinking (EC=50-1000 μs/cm) (Figure 6). Halim  signified that the EC values of water samples from ground water at Trishal upazila under Mymensingh district varied from 348 to 497 μS/cm and 255 to 387 μS/cm reflecting medium salinity in nature in both seasons. Table 1: Water quality parameters for water collected from different tubewells of Tatholia union. Table 2: Water quality parameters for water collected from different tubewells of Magan-Siader Union. Table 3: Water quality parameters for water collected from different tubewells of Gaglajur Union. Figure 3: Dissolved oxygen content in water. Figure 4: Biochemical oxygen demand content in water. Figure 5: pH content in water. 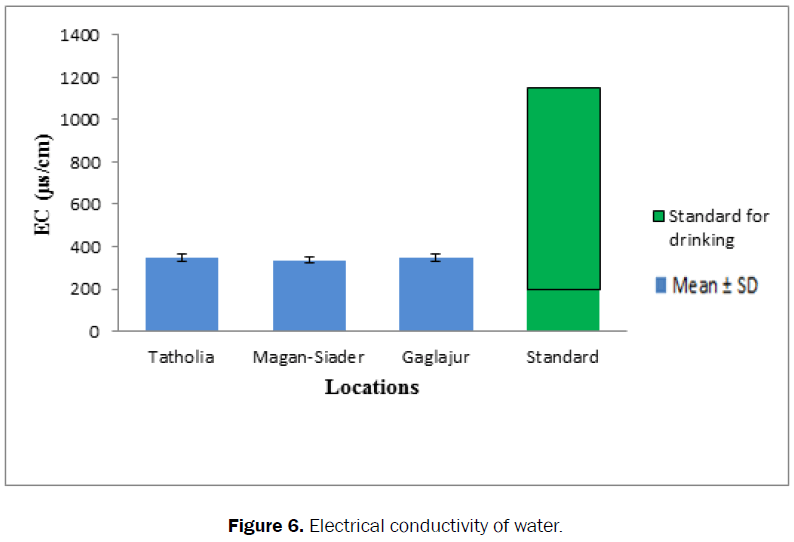 Figure 6: Electrical conductivity of water. 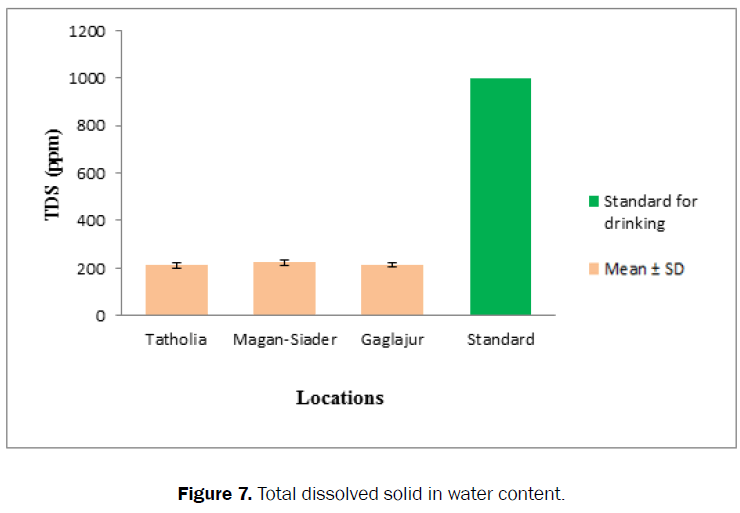 The highest mean value (TDS=223.95 ppm) of Total Dissolved Solid (TDS) was found in Magan-Siader Union and lowest mean value (TDS=211.5 ppm) of TDS was found in Tatholia Union that was within the standard level of TDS for drinking (TDS= 1000 ppm) (Figure 7). Alam  conducted an experiment in wetland and sediments of Bhuluka region in Mymensingh and found TDS value (120.190 ppm). The highest mean value (P=2.268 ppm) of Phosphorous (P) was found in Magan-Siader Union and lowest mean value (P=2.3 ppm) of Phosphorous (P) was found in Tatholia Union that exceeded the standard level of P for dinking slightly (P=2 ppm) (Figure 8). The concentration of phosphorous ranged from trace to 0.05 ppm and this anion was dominant in ground water as compared to surface water in Tongi aquifer under Gazipur district . The highest mean value (Fe=8.74 ppm) of Iron (Fe) was found in Tatholia Union and lowest mean value (Fe=8.35 ppm) of Iron (Fe) was found in Gaglajur Union that exceeded the limit of standard of Iron (Fe) for drinking extremely (Fe=0.3-1.0 ppm) (Figure 9). An experiment on water samples collected from different location of Bogra city and found the value of Fe ranged from 0.63 to 1.02 ppm . The highest mean value (As=0.1) of Arsenic (As) was found in Tatholia and the lowest mean value (As=0.075) of Arsenic (As) was found in both Magan-Siader and Gaglajur Unions that exceeded the standard level of As for drinking (As=0.05 mg/l) (Figure 10). The British Geological Survey (GBS) and Department of Public Health and Engineering (DPHE), Bangladesh found 0.1450 mg/l mean value of Arsenic (As) in 2001. Nizam et al. observed that out of 130 surface and groundwater samples collected from Madhupur tract, the content of arsenic (As) fluctuated within the limit of trace to 0.05 mg/L. Figure 7: Total dissolved solid in water content. 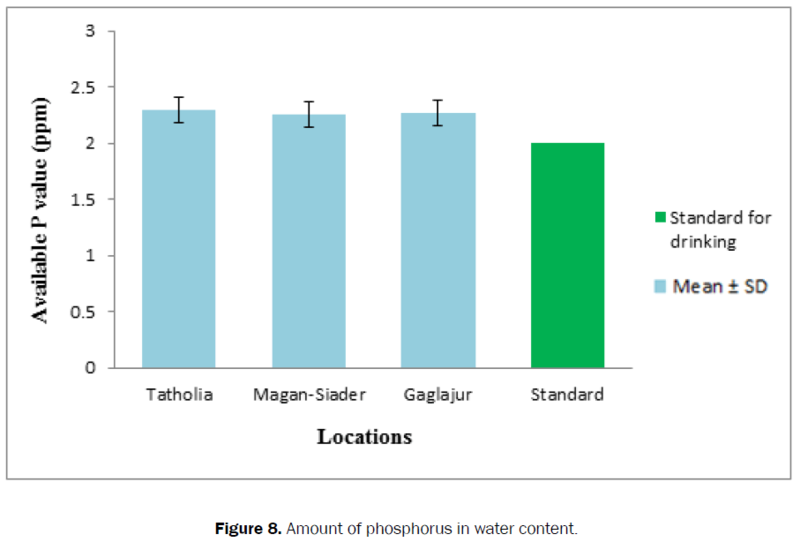 Figure 8: Amount of phosphorus in water content. Figure 9: Amount of Fe in water content. Figure 10: Amount of As in water content. The highest mean value (NO3-=7.43 mg/l) of nitrate (NO3-) was found in Tatholia Union and lowest mean value (NO3 -=7.18 mg/l) of nitrate (NO3-) was found in Magan-Siader Union that was within the standard level of nitrate for drinking (NO3-=10 mg/l) (Figure 11). Figure 11: Amount of NO3- in water content. 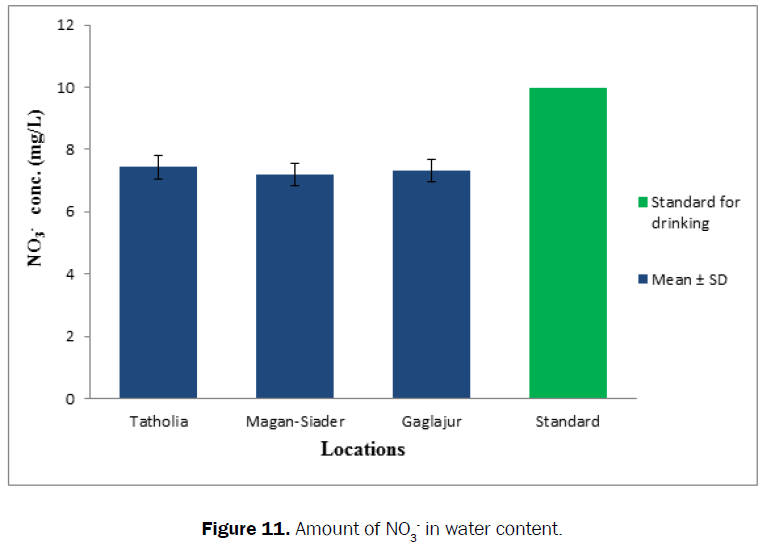 The mean values of Iron (Fe) of tubewell water collected from Tatholia, Magan-Siader and Gaglajur Unions were 8.74 ppm, 8.46 ppm and 8.35 ppm respectively (Figure 12). 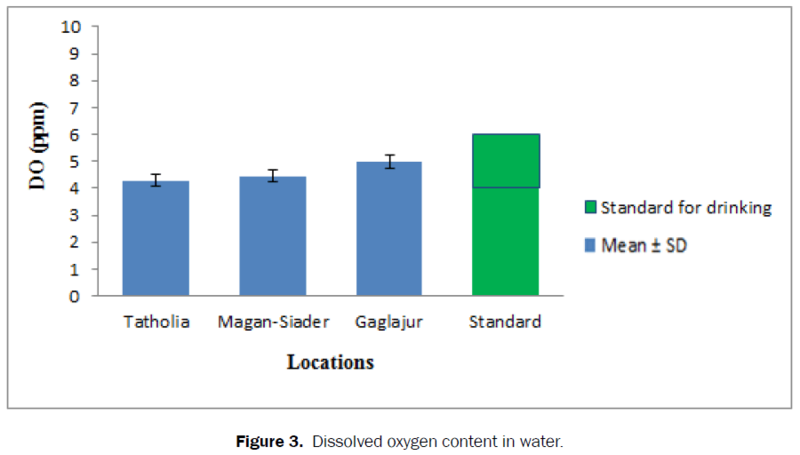 The mean value of Iron (Fe) of tubewell water collected from Tatholia, Magan- Siader and Gaglajur Unions Union exceeds the limit of standard of Iron (Fe) for drinking extremely (Fe=0.3-1.0 ppm). 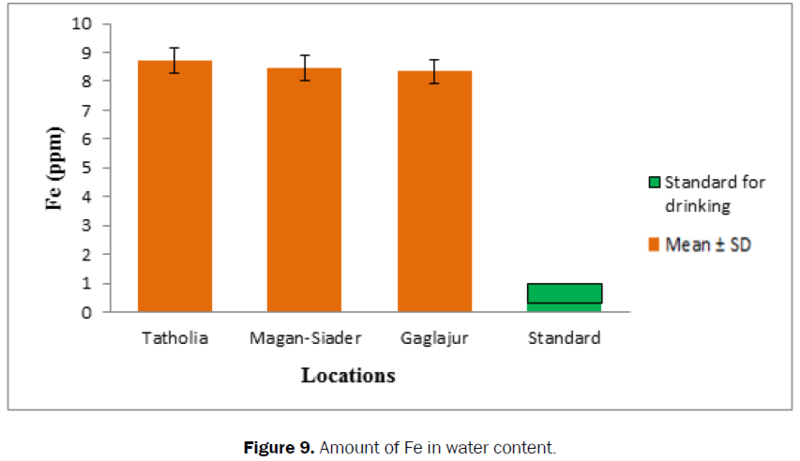 Whereas the mean value of Iron (Fe) of haor water collected from Tatholia, Magan-Siader and Gaglajur Unions Union was 0.88 ppm which was within the standard level of Iron for drinking (Fe=0.3-1.0 ppm). Inverarity et al. analyzed some water samples collected in two season from river Elan, Mid Wales in Great Britain and reported that the mean concentration of Fe in May and September were 0.26 to 0.61 ppm, respectively. An experiment on ground water samples collected from different location of Bogra city and found the value of Fe ranged from 0.63 to 1.02 ppm  (Table 4). Figure 12: Amount of Fe concentration (Tubewell and Haor). Table 4: Water quality parameters from different locations of Dingaputha haor. The Total Coliform Count (TCC) of tubewell water collected from Tatholia union ranged from 30 cfu/100 ml to 39 cfu/100 ml where the mean value was 34.4 cfu/100 ml ± 3.44 cfu/100 ml. The TCC of tubewell water collected from Magan-Siadar union ranged from 25 cfu/100 ml to 35 cfu/100 ml where mean was 29.4 cfu/100 ml ± 8.88 cfu/100 ml. The TCC of tubewell water collected from Gaglajur union ranged from 27 cfu/100 ml to 38 cfu/100 ml where mean was 32.8 cfu/100 ml ± 8.97 cfu/100 ml. The TCC) of Dingaputha haor water ranged from 74 cfu/100 ml to 87 cfu/100 ml where mean was 80.5 cfu/100 ml ± 24.48 cfu/100 ml. The TCC from both tubewell and haor water exceeded the standard level. On the other hand, the geometric mean of TCC of Fresh, Acme, Pran, Mum, Jibon and Dada were 18, 12, 26, 12, 9, 43 cfu/100 ml respectively (Figure 13) . Figure 13: Total coliform count (TCC) of water collected from tubewells and haor. The study revealed that drinking water sources of the study area are fully depending on underground through tubewell. The study also revealed that 76% respondents used tubewell, 12% respondents used haor , 10% respondents used river and 2% respondents used pond water for drinking purpose. The study found that most of respondents have self tubewell (82.5%) and others (17.5%) have no ownership of tubewell and they collected water from other person’s tubwell and others water sources (river, haor , pond etc.) (Table 5 and Figure 14). Table 5: Ownership of tubewell. Figure 14: Sources of drinking water. The study found that most of the respondents (45.7%) used ring slab with water seal toilet, 22.8% respondents used hanging toilet used, 12.8% respondents used pit latrine, 11.4% respondents used bush toilet and rest of the respondents (7.1%) used open field (Table 6). Table 6: Type of toilets used by respondents. The study found that distances between toilet and tubewell were 10 ft (25% tubewells), 15 ft (30% tubewells), 20 ft (20% tubewells), 30 ft (15% tubewells) and above 40 ft (10% tubewells) respectively (Figure 15). Figure 15: Distances between toilet and tubewell. The study revealed that 30.3% respondents were suffered from skin diseases, 28.7% respondents were suffered from diarrhoea, 14% respondents were suffered from cholera, 10.1% respondents were suffered from liver diseases (Cirrhosis, Cancer), 8.6% respondents were suffered from typhoid and 8.3% respondents were suffered from fatigue (Figure 16). Figure 16: Suffering from water borne diseases during natural disasters (Flood, Tidal Surge, Cyclone etc.). An investigation was carried out to assess the drinking water quality parameters from different sources (Tubewells and haor ) and hygienic conditions of people living around the Dingaputha haor areas of Netrokona District. It was found that the levels of DO, pH, EC, TDS, NO3- from both tubewell and haor water were within or near to standard level for drinking and the levels of BOD, Phosphorous (P) from both tubewell and haor water exceeded the standard level for drinking slightly. The highest ranges (As=0.05-0.15 mg/l) of Arsenic (As) concentration were found in Tatholia Union and the lowest ranges (As=0.05-0.1 mg/l) of arsenic (As) concentration were found in both Magan-Siader and Gaglajur Unions which exceeded the standard level for drinking purpose (WHO, 2003). The highest iron concentration (Fe=10.78 ppm) was observed in tubewell water of Tatholia Union which exceeded the standard level for drinking and the lowest iron concentration (Fe=0.75 ppm) was found in haor water which was within the standard level for drinking. Materials from lactose fermentation tubes were inoculated onto EMB agar plates which after incubation showed smooth circular colonies with dark centers and metallic sheen and onto MacConkey agar plates which after incubation showed rose pink color colonies ensured the presence of Escherichia coli bacteria in water. The highest number (TCC=80.5 cfu/100 ml) of Escherichia coli (E. coli) bacteria was found in haor water due to open toilets nearby haor and the lowest number (TCC=29.4 cfu/100 ml) of Escherichia coli (E. coli) bacteria was found in tubewell water of Magan-Siader Union both of which exceeded the standard for drinking purpose. It was also observed that about 82.5% people had access to tubewell water for drinking and 17.5% people had no access to tubewell water for drinking. Most of the people used tubewell water for drinking. On the other hand, most of the people used haor water for cooking purpose because tubewell water contained excessive iron (Fe) concentration. It was observed that the cooked rice and vegetables using tubewell water were turned into black color due to excessive iron (Fe) concentration. The hygienic condition of Digaputha haor area of Netrokona District was very poor. The distances between tubewell and toilet were very near to each other and the open hanging toilets nearby haor were also found. For this reason, both of tubewell and haor water might be contaminated with microbial organisms such as E. coli. People using contaminated tubewell water for drinking and haor water for cooking were infected with various water borne diseases such as diarrhoea, cholera, typhoid, liver diseases (Cirrhosis, Cancer), skin disease etc. From the findings of study it can be suggested that Fe concentration should be minimized within permissible limit using iron removal plant before drinking water, arsenic concentration should be minimized within permissible limit using filter media such as the Sono filter before drinking water and Government of Bangladesh with help of NGOs should take initiatives to improve water quality and sanitation in haor area. The authors sincerely acknowledged the Prof. Dr. Mohammad Hussain Central Laboratory, Bangladesh Agricultural University, Mymensingh for giving laboratory facility and Wateraid Bangladesh for providing financial assistance. Ahmed MF and Rahman MM. Water Supply and Sanitation-Rural and Low Income Urban Communities, ITN-Bangladesh, Center for Water Supply and Waste Management. BUET, Dhaka, Bangladesh. 2000. Azad AK. Impacts of Farakka Barrage on surface water resources in Bangladesh. World Environment Day. The Report of Department of Environment, Government of Bangladesh. 2003;40-43. Ali MA. Public private priority for water resource management in Bangladesh water. Two billion people are dying for it. Department of Environment, The Government of Bangladesh. 2002.
WHO. UnWater Global Annual Assessment of Sanitation and Drinking water: Targeting resources for better results. WHO, Geneva. 2010. Elizabeth MJ. Water Aid. An Overview of the Arsenic Issue in Bangladesh Dhaka. 2000. Bangladesh Bureau of Statistics. Statistical Yearbook of Bangladesh-2013. Ministry of Planning Government of The People's Republic of Bangladesh, Dhaka. 2013. Rani N, et al. Assessment of temporal variations in water quality of some important rivers in middle Gangetic plains, India. Environmental Monitoring Assessment. 2011;174:401-415. Rahman MS, et al. Assessment of treated wastewater comes from decentralized wastewater treatment system at Rakibnagor slum, Tangail, Bangladesh. Bangladesh Journal of Environmental Science. 2014;27:106-109. Jesmin MS. Pollution studies on groundwater for irrigation, drinking and industrial usage in Gaibandha aquifers. M.S. Thesis, Department of Agricultural Chemistry, Bangladesh Agricultural University, Mymensingh. 2000. Halim MA. Seasonal variation of pond water quality in selected fish farms of Mymensingh area. MS Thesis, Department of Agricultural Chemistry, Bangladesh Agricultural University, Mymensingh. 2009. Alam MS. Assessment of surface water quality for agricultural usage in Chalan Beel area. Department of Agricultural Chemistry Bangladesh Agricultural University, Mymensingh. 2008. Sen R, et al. Ground water and surface water quality for irrigation in some selected sites of Tongi in Gazipur district. Bangladesh Journal of Agricultural Research. 2000;25:593-601. Begum K. Assessment of heavy metal contamination in some soil and waters of Bogra city, Bangladesh. MS Thesis, Department of Agricultural Chemistry, Bangladesh Agricultural University, Mymensingh. 2011. Nizam MU, et al. Copper, manganese, iron, zinc and arsenic toxicity detection in water sources of Madhupur Tract. MS Thesis, Department of Agricultural Chemistry, Bangladesh Agricultural University, Mymensingh. 2000. Inveraity RJ, et al. The effect of Impoundment on the Downstream Macroinvertebrate Riffle Fauna of the River Elan. Midways Environmental Pollution. 1983;32:245-267. Zaman AS, et al. A random study of the microbiological quality of bottled drinking water in Bangladesh. Proceeding of the 110th American Society for Microbiology (ASM) Conference. 2010.